Reger’s Violin Sonatas lay bare the many contradictions of his art. Elegant, free-flowing melodies float across dense, chordal accompaniments. The forms of movements look back to Baroque and Classical models, yet the scale and emotional involvement of the music places it firmly in the late-Romantic era. And the harmonies are complex and filled with chromatic inflection, but outright dissonance is almost wholly avoided. The Second Sonata dates from the earliest years of Reger’s compositional career, while the Third demonstrates some of the greatest achievements of his maturity. Yet the similarities between them outweigh the differences. Both are cast in four movements, with a large-scale Allegro followed by a brief scherzo, a lyrical adagio and an upbeat finale. Compositionally, the Third is the finer Sonata, but its wayward harmonic progressions can be difficult to fully appreciate at first listening. Fortunately, the quality of playing from Ulf Wallin and Roland Pöntinen makes repeat auditions an attractive option. Wallin has an excellent command of the music’s long, weaving phrases, while Pöntinen injects a sense of levity and flow into every accompanying texture, however dense the notation. Wallin’s focused tone helps to clarify the direction of Reger’s melodic lines. He plays with a narrow and unobtrusive vibrato, allowing him to project an impressively muscular sound in the louder passages. We hear the occasional scratch of bow against string when Reger demands both intense volume and superhuman speed, but it rarely distracts. Wallin also has an excellent low register, producing a rich, even tone on the G string. That is a particular benefit in the slow third movements of each Sonata, where the melodies often explore the lower reaches of the violin’s range. Reger is often accused of writing dense and unimaginative music, but the inner movements of both Sonatas demonstrate how wrong that perception is. The second movements, an Intermezzo in the Third Sonata and a Scherzoso in the Second, are as light and nimble as anything you might find in Schumann, or even Mendelssohn. And the melodic contours of the slow movements are as seductive as any. The largo third movement of the Third Sonata is a particular treat, and is a masterly demonstration of variation form, one of Reger’s greatest strengths. The program concludes with the curiously asymmetrical op. 87, made up of a short Albumblatt followed by a much more substantial Romanze. Both are finely crafted, but the Romanze is the real gem. 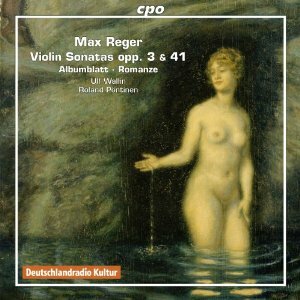 Like the slow movements of the sonatas, it is based on a long flowing melody, which seems to roll on continuously for the movement’s entire 12 minute duration.This disc marks the end of a complete cycle of Reger’s Violin Sonatas from Wallin and Pöntinen. Although recordings of the individual sonatas make occasional appearances, their technical and expressive demands make complete cycles a rarity. As a result, these fine recordings look destined to become the benchmark for years to come, combining as they do musical precision, artistic expression and sound engineering of the highest order.